Mighty Jack Volume 1 Review – AiPT! 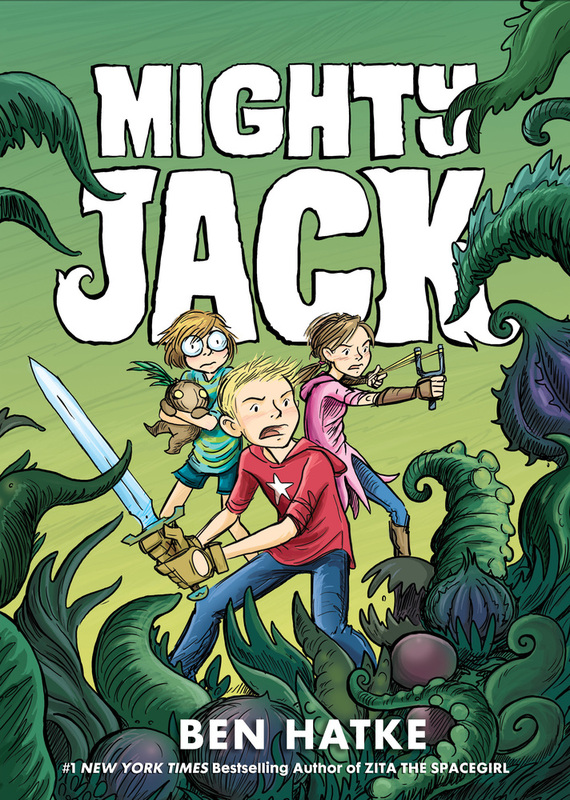 First Second Books is currently in the swing of publishing their full line of new Fall books, one of them being Ben Hatke’s Mighty Jack. “Jack and the Beanstalk” is one of the most notorious children’s tales that’s been adapted in literature and film countless times. Hatke attempts to create his own, unique version of the story with this modern, child-friendly comic. Is it good? Ben Hatke is an acclaimed children’s writer and artist, best known for his works Julia’s House for Lost Creatures and his series Zita the Spacegirl, the former reaching number one on the New York Times Best Sellers. While the majority of his work is aimed at children, his comics and graphic novels can be appreciated by readers of any age. Hatke’s fantastical work clearly represents his desire to give his daughters, and other children, positive role models that are realistic and struggle with real life decisions. Mighty Jack perfectly exemplifies Hatke’s writing talent and creativity. The story chronicles the summer of a young boy named Jack who, with the company of his sister Maddy, comes to possess a whole case of magical seeds. Left alone for the majority of summer, Jack and his sister plant a garden only to discover there’s more to the mysterious seeds than meets the eye. With the help of their newly acquainted neighbor, Lilly, the trio of children explore the dangerous, bizarre and beautiful depths of their alien garden. While initially set-up as a simple modernization of “Jack and the Beanstalk,” this book actually deviates a great deal from the original tale and can be viewed more as an introduction to a much longer story that will be expanded within a multi-book series (ergo, Mighty Jack: Volume 1). I would encourage anyone with younger kids to seek out Hatke’s work, but this one in particular would make a fine introduction to the comic genre. Coming from an early childhood education background, I found this book to be one of the best examples of a graphic novel that could easily be implemented within a classroom curriculum. The reading level is between 2nd and 3rd grade, while including some more advanced sight words, and can be used as a primary example of fairy tale adaptations. Although what I love most about the book are the characters and how authentic they feel, including Jack’s exceptional sister who doesn’t speak. While there are times when Jack shows disdain or even embarrassment for Maddy, the plot of the story itself is put into motion by Jack’s love of his sister. It’s a great message for children and it’s shared within a colorful and creative comic medium. Hatke has once again produced a fantastical and engaging child-friendly graphic novel. Mighty Jack is a unique and modern twist of the class tale that provides beautiful art and a fun storyline with good morals. This is a perfect introduction to Hatke’s work and a great way to break children into the comic world.